I will forever associate The Dorchester with shoe polish. To be precise, with yellow shoe polish. You will know, I am sure, about which hotel I am speaking. Since it opened in 1931, this temple of luxury on London’s Park Lane has been one of the world’s most famous destinations for those who wish to pause awhile in Britain’s capital. Now that it has emerged from a refurbishment costing many millions of pounds, it sparkles as it must have done on its first day. From the sharp angles of the stone exterior, you might expect the interior to be all Art Deco of the American sort. In fact, from the dazzling gilt of the entrance hall to the pillared splendour of the Promenade and the palatial Spanish of the Grill Room, it all manages to be resolutely English. 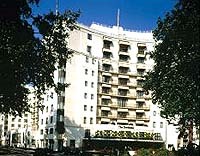 Because, amidst all the stylistic eclecticism, the Dorchester style of service is old-fashioned, courteous and proper. Just as I like it. I checked into room 512. As a ‘superior’ (i.e. standard) double, this cost – with breakfast – £422 a night for two. Overlooking Hyde Park, I felt at home in this air-conditioned confection in the French manner. Its colour scheme of green (the bedspreads, wallpaper and curtains), beige (the carpet) and pink (the brocade of the two fauteuils) seemed right. True, it was not the largest hotel room I have encountered, but its proper hall, its mahogany doors and its bracketed cornice – picked out with gold leaf – imparted a sense of grandeur to the cosiness. And I particularly liked the carriage clock on the bedside cabinet. (Too many hotels think a digital time-display on the television is sufficient for their guests.) After a few experiments with the 3 table lamps, the standard lamp and the 2 wall brackets, the lighting was perfect, so I went to explore the bathroom. One thing I do want from an hotel is a good bath towel. Here, they were magnificent. Fully six feet long, white and fluffy. And the rest of the provisions were good, too. White marble for the walls and the floor, a tub both long and deep, a separate shower cubicle, a bidet, Floris toiletries, lots of mirrors (including a properly placed one of the magnifying sort, for shaving) and spotlights in the ceiling. Only the position of the loo – right behind the door, which opened onto it – was a trifle odd. I returned to my bedroom and looked out of the window. The trees in Hyde Park leaned this way and that with the breeze. Down below the endless streams of traffic flowed up and down Park Lane. The quiet was remarkable. Either my deafness has reached chronic levels or The Dorchester has some of the most effective double-glazing in London. I hope it is the latter. Certainly, my afternoon doze was uninterrupted. After this restoration and a relaxing bathe, I sallied forth for dinner. Since top class restaurants serving English food are rare nowadays, I decided my destination should not be the hotel’s Oriental Restaurant, but rather its Grill Room. This is an impressive chamber, full of red and gold. Whether Spanish palaces ever really looked like this, I do not know. I felt – under the high ceiling, surrounded by rough white walls with tapestries, sitting on a leather armchair before a polished wooden table – as if I were on a film set. And I loved it. The menu told me that I should not smoke and that I should turn off my mobile telephone. Instructions of which I entirely approved. From the set menu offered by Chef Henry Brosi (3 courses plus coffee for £39.50), I selected asparagus with puff pastry and lobster sauce – a well-judged combination. Then it was on to the carte for Scottish smoked salmon, served with lemon, onion and brown bread and butter, followed by roast beef and Yorkshire pudding. Both were carved by the table and both were straightforwardly enjoyable. Pudding was from the trolley, a pink champagne jelly with strawberries and blueberries. (These 3 courses from the carte were £49.50.) Restaurant manager Michael DiFiore orchestrates the efficient service from waiters in black tie. The wine list is interesting rather than encyclopaedic. There are 27 half bottles and 13 wines are available by the glass – like a 1997 chianti for £8.50. France occupies 17 of the 31 pages, with post-1966 clarets the strongest section. 1970 Lynch Bages can be had for £480, 1982 Haut Brion for £530 and 1970 Latour for £860. My own drinking produced mixed results. A 1999 New Zealand chardonnay (Redwood Valley, Nelson - £43) had a citrus nose, was rather closed in the mouth, but then yielded up a delightfully long and creamy aftertaste. Delicious. My red burgundy, however, was a disappointment. This particular 1989 Gevrey Chambertin (Clos des Varoilles, Domaine des Varoilles - £120) posessed no vegetal nose, no whiff of the farmyard and no depth of ripe red fruit. Best avoided. I decided to have my coffee in the Promenade, the noble classical chamber to which I was brought as a boy for tea. Cosseted by the plumpness of a soft sofa, I luxuriated in the sweetness of nostalgia. Jeff Phillips, the excellent pianist, asked me for a request. What else could it be? ‘As time goes by’ swirled around the columns and the capitals and the architraves and made this contented diner more contented still. Where more appropriate than The Dorchester for that line, ‘The fundamental things of life, as time goes by…’? So what of the yellow shoe polish? A pair of shoes of this bright hue had just been made for me by a gentleman in Marylebone – to go with my summer suit from Maurice Sedwell. But, despite searching London high and low, I simply could not track down any shoe cream of the right colour. What to do? Well, what does one always do when in a quandary and staying at a grand hotel? Ask the concierge. I left my enquiry with him and went out for a walk. Upon my return, the answer was waiting: a shop at 449 Edgware Road had exactly what I needed. Thus for me did The Dorchester become inextricably linked with yellow shoe polish. I salute The Dorchester and I salute its concierge. Great hotels care about the little things. And The Dorchester is a great hotel. Park Lane, London W1A 2HJ, England.